After lots of googling I got this useful blog with lots of must-to-have links for NS2, ZigBee and most of the tools to do the simulation. We are going to have a course project for network simulation on WPAN and ZigBee and these rare resources are very handy to start with. E-payment or e-wallet which is actually implemented as m-wallet is the biggest shot of NFC. Use of m-wallet in e-ticketing is replacing the current payment method such as mobile (SMS, web based) payment or using traditional plastic card. New generations of contactless Mastercard (paypass) or Visa (paywave) cards are available in market for customers. Currently operators are offering mobile payment with NFC-enabled mobile phones. According to reports by 2010 NFC phones are able to replace all kind of payment card or mobile based payment systems. Turn your photos of places and thing to some virtual reality thing. If you have live account (you @hotmail is accepted of course) try Photosynth, make your 3D VR of your photos and save them in your 20GB , for free, space in the site. Photosynth – from Microsoft. Imagine being able to share the places and things you love using the cinematic quality of a movie, the control of a video game, and the mind-blowing detail of the real world. With nothing more than a bunch of photos, Photosynth creates an amazing new experience. via Windows Live Photo & Video Blog : Extras. Street at night passgin ront light car trail, originally uploaded by arash_m. 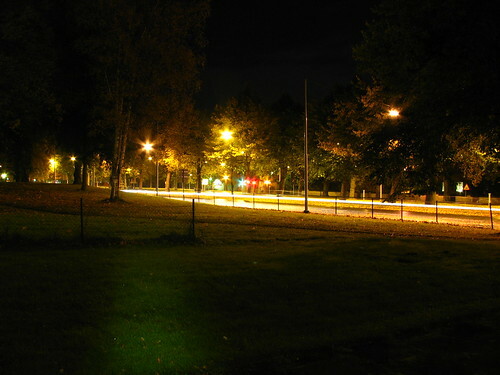 I like photos at night and long open shutter pictures… this is the street behind our building. A balanced amplifier has two amplifying devices that are run in quadrature. That is, they are operating 90 degrees apart in transmission phase. A quadrature coupler or splitter on the input phase-shifts the two signals 90 degrees at the amplifier inputs, then a second quadrature coupler on the output “un-phase-shifts” the signals at the amplifier outputs so they combine in phase. via Balanced Amplifiers – Microwave Encyclopedia – Microwaves101.com. Obviously it is not an easy life for viruses in a linux box, read the article it’s well explained. If you receive an error like “The YARPP database has an error which could not be fixed.” or “…The used table type doesn’t support FULLTEXT indexes…” after installing YARPP, either your database username does not have access or you need to change your database engine for “wp_posts” from InnoDB to MyISAM. to solve the aceess problem visit here and try to run SQL manual. To change the engine goto to myPhpAdmin and select “wp_posts” table>operations->engine. Gigya Toolbar :Add the Gigya Toolbar for Free and Increase Traffic and Engagement! Get return traffic when users share and tweet from the toolbar. Supports 80 social destinations and includes a Facebook fan page and Twitter updates buttons. FREE and takes only 2 minutes to add to any site – no coding needed. The toolbar does not affect page load time! It loads only after the page is fully loaded. To learn more click here. To see example sites that added the toolbar click here.